You may have noticed a cardboard cutout of Will D. Cat hiding in various places all over the Library. Will’s recent adventure was part of the Library’s annual study room promotion. While past contests had Villanova students choosing their favorite study snack or sharing what they haul to Falvey, this year’s theme focused on exuding the Wright ‘Catitude. 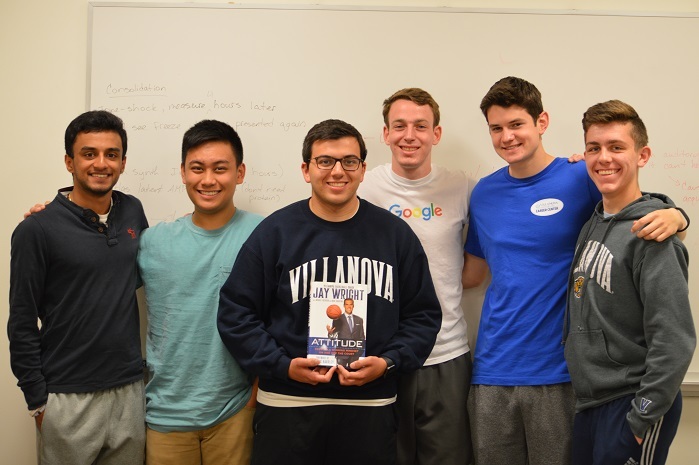 As Jay Wright exclaims in his new book, Attitude: Develop a Winning Mindset on and off the Court, “Our attitude sustains us and is the foundation for all that we do…there is a leader in every one of us.” Channeling Coach Wright’s optimistic outlook, the Library asked students to share a photo with Will D. Cat showcasing their positive Falvey ‘Catitudes (see what we did there). Over the last few weeks, multiple #FalveyCatitude entries were uploaded to the Library’s social media accounts. Christopher LeClerc tweeted, “@FalveyLibrary me and my friend @k_tuazon01 need to win this study room so us and all our friends can ace finals!!! #FalveyCatitude.” Here’s to acing finals, LeClerc was the lucky Wildcat chosen from a random drawing of all the #FalveyCatitude entries. Gaining temporary access to a private study room in Falvey, LeClerc was also gifted with a copy of Attitude. He and five of his friends (from left to right: Vivek Mohan ‘19, Kevin Tuazon ‘19, Christopher LeClerc ‘19, Nils Lofgren ‘19, Sam Olson ‘19, Matt Massina ‘19) were treated to pizza, chips, pretzels, cookies, candy and fruit. Thank you to all who entered the contest, and good luck on finals! Even if you didn’t win the private study suite; call, E-mail, or stop by the Library for assistance this (finals) week. Falvey will be open Monday, May 8, through Thursday, May 11, from 8:00 a.m. – 3:00 a.m. The Dugan Polk Family Reading Room and the First-Floor Lounge (Holy Grounds Cafe`) are available for 24/7 study (don’t forget your Wildcard.) You got this, Wildcats! Utilize Falvey’s helpful resources and conquer finals with the Wright ‘Catitude! Article by Kallie Stahl, Communication and Marketing Specialist; photo by Hunter Houtzer, Communication and Marketing Graduate Assistant.